Ousam Cham crosses to Gabriel Johnson for Brighouse's second goal. Picture: Steven Ambler. Brighouse Town moved up to third in the Evo-Stik East with a magnificent 3-0 triumph over Frickley Athletic on Tuesday evening. Vill Powell's side took the lead in the 13th minute and never looked back as they inflicted a third defeat of the season on Frickley. The Town boss hailed the performance of his team in all departments but insists they are still a work in progress. However, he did state that the performance was: "Good, good, good all the way." He continued: "You couldn't single a player out, they all put in a shift and more, against a side that was playing at home and were level with us on points before kick off. "In fact, if we had taken more of the chances we made for ourselves then the scoreline would have seen a few more goals. "We had them for skill and pace and I must say out wide Ousman Cham and Marley Grant in the first half and then both Tom Robinson and fellow substitute Jack Normanton gave them nightmares." Brighouse opened the scoring when a cleared ball found Marley Grant on the right. He skipped down the line before working the ball to Gabriel Johnson who in turn found his strike partner Aaron Martin who gave Daniel Wallis no chance in the Athletic goal. At the other end, Brighouse stopper Jordan Porter didn't have much to do as the visitors dominated proceedings. Town had to wait until the 55th minute for their next goal. The speedy and skilful Cham beat his man and cut inside before flashing the ball across the face of the goal to Johnson who buried the ball in the back of the net. Read the report from Brighouse's 1-1 draw at Wisbech. Frickley still held out hope of getting back into the game and began to turn the screw. 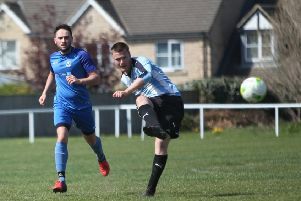 Tyler Walton came closest to halving the deficit when he broke through and delivered a thunderbolt of an effort which Porter tipped up onto his crossbar before smothering. Jacob Hazell sent a thumping shot toward the goal but Porter was alert once again to pull off a great save. When Johnson was replaced by Normanton in the 79th minute the momentum from fresh legs increased the pressure on the home goal. Four minutes later and the match-sealing goal came from Cham - who played at Frickley as a youngster - after Martin and Normanton had also tried to stab it home. Normanton had several forays on the home goal using his pace but was thwarted on each occasion. It didn't matter, however, as Town walked away with three valuable points to go third in the table.